Rembrandt, in his last major work, interprets and adds a new meaning to this biblical story. The original story describes the older son as somewhat negative and justifiably so – he was just deprived of his father’s undivided love, and complete inheritance, half of which he just lost to his “unworthy” rascal brother. 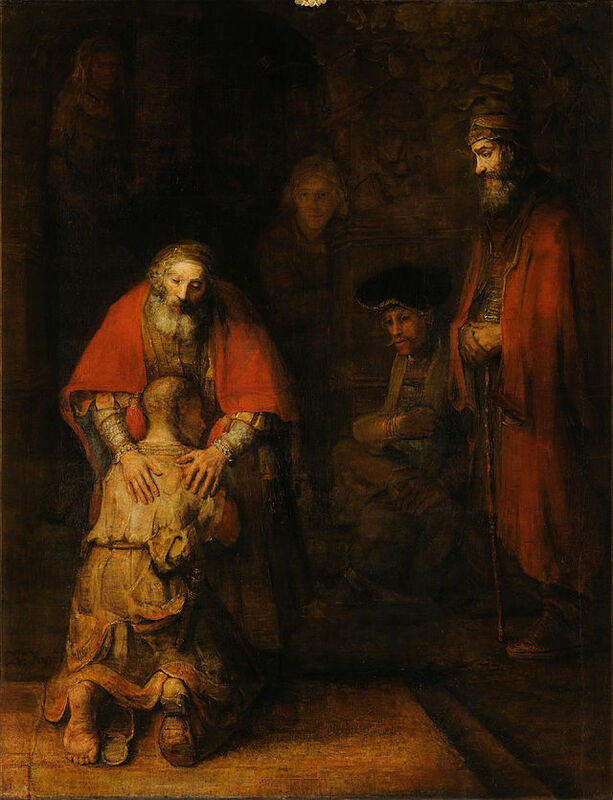 It seems to me that Rembrandt use him to represent a hard working spiritual seeker, struggling to follow the higher right, as embodied by the father. I am told that Rembrandt said about this work: “This is my final message to the world”. And indeed, it is a complete “model of the universe” or more practically, a detailed description of human psychology and a guidebook for spiritual work. There are six figures in the picture, arranged in two triangles, similar to a Star of David. The big triangle, pointing downwards is formed by the prodigal son at the bottom, his brother to the right and an almost invisible young girl (maybe their sister?) entering the scene, at the top. The other triangle, smaller and almost enclosed in the first, includes the father, another wealthy older man (his friend?) and a young man – possibly one of the house servants. The three figures mentioned in the bible: the father and two sons, are much more detailed, colorful and in the foreground, while the others are sketched, more in the shade, and in the background. The father is clearly a rich man. This is subtly visible in his dress. He is not trying to display his wealth. It is not a wealth of personality. The expression on his face is almost unknown or mysterious. It seems unclear at first, yet slowly one sees much pain and suffering, but no sign of self­pity or bitterness. His face expresses all the contradictory emotions evoked in the situation: happiness, sorrow, joy, anger, surprise, hurt, and gratitude, all in harmony. This is the face of conscience. His big hands, laid on his young son’s shoulders express love and complete acceptance. We see the young son from the back. Only a hint of his expression­less face is visible, just enough for us to know that he gave up all illusions. It is primarily the illusion that he has anything to lose. He is kneeling on a raised square stone, probably a special area in the room, reminiscent of an altar. Maybe it is a reference to the sacrifice of Isaac, a much earlier Rembrandt painting displayed on the far side of the same room. His clothes are ragged, his shoes have holes, and one of them fell off as he lowers himself to get his father’s greeting. The only reminder of his earlier wealth and power is a knife. Unlike anything else about him it is in a surprisingly good condition. One wonders if this means that he gave up willingly the option of violence in return for real love. Maybe passing the same test, which Romeo (of Juliette) passes first and then, on the second trial, fails. Self­will is violent. It is a knife one keeps ready to draw when the externals seem threatening. Complete acceptance includes giving up self­will and instead learning to trust something higher. Allowing all influences in as potentially blessed, meaningful and coming from a higher source. Feeding for a while with the pigs might be a prerequisite for such level of acceptance. same time a part of him wants to follow his father’s spiritual guidance. Can he give up his false identity, or the illusion of “doing”? All these figures represent parts of our own psychology. We all have that father within, at least potentially. That is the part that is able to accept and love unconditionally. First of all love and accept ourselves. We also have the older brother within, who worked diligently, followed the rules which come from some larger organization, authority, or law. That is the part that wants to always be a good boy or girl. Can we face injustice? Can we learn to see from another scale that our brother, the prodigal son (internal or external), deserves as much as we do and has at least the same possibilities? Can we forgive him, share with him all we have and thus acquire a treasure in heaven? Or maybe we can simply give up self­will and follow our inner father just because we trust he knows better or we can sense that it is the higher right? In the painting there are the three more characters that are not mentioned in the biblical story. The first two are unidentified observers. The older one, the rich friend, has some emotional involvement in the scene. He seems pleased to see the prodigal son returning, and happy to share the father’s joy. Many people do not notice the young girl at the top of the painting. The painting is dark and the reflection from the window in sometimes harsh. One needs to move around the painting, and come again at different times of the day, then observe for a long time. She is the only one moving. Maybe the emotional efforts of all the others enable her to lightly dance into the scene through the open door. These three characters might represent aspects of the observing self, soul, and spirit. When I first saw this painting in the Hermitage museum in St. Petersburg, I was struck by the amazing transformation of the biblical story. Two days later, I went again with some friends and we tried to spend a whole hour in the presence of this great painting. The tourist groups, in a variety of languages, frequenting this point as a part of their quick tour of the Hermitage, add additional dimensions to the experience. Some of the tour guides are quite knowledgeable and can deepen the perspective. While others whiz by, just like the many thoughts and feelings going through one’s mind. Revisiting there a few years later completed the experience for me. My hope here is to share my realization that self­acceptance is not a side issue, but rather an essential part of the effort to raise awareness and be present. When one is even a little more mindful, everything acts as a mirror. One is flooded with a stream of images and new connections. If one is unable to accept them, one is thrown back to a lower, more sleep like state. On the other hand, if one is open to what one sees and feels and can say with Prospero in the “Tempest”: “This thing of darkness I acknowledge mine”, the state is extended and deepened.